AsthmaMap (http://asthma-map.org) is a community-driven project initiated as a part of U-BIOPRED (Unbiased Biomarkers for the Prediction of Respiratory Disease Outcomes) data analysis and integration platform and then continued within eTRIKS (European Translational Information and Knowledge Management Services). 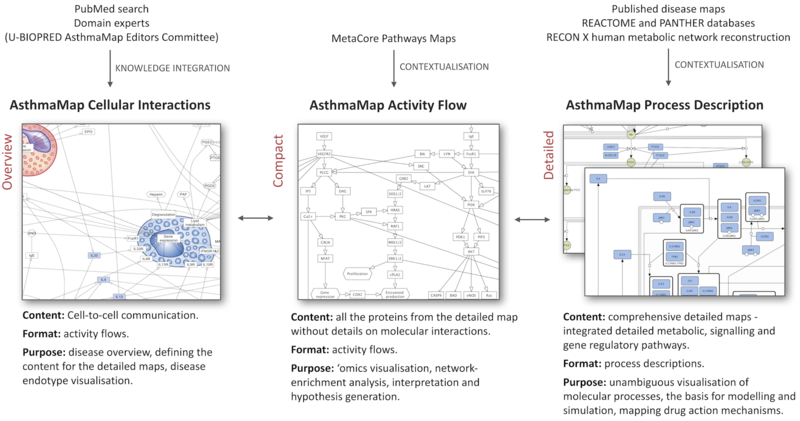 Develop a pathway-based network reconstruction of the asthma mechanisms. Map fingerprints (one type of 'omics) and handprints data (several types of 'omics) to the network. Perform network-based analysis, interpretation and hypothesis generation. AsthmaMap Process Description (the most detailed layer). The high-level view includes 22 cell types and is connected to the underlying pathways. It can be used for data interpretation on systems level while keeping the focus on the involvement of different cell types in asthma pathogenesis. U-BIOPRED data mapping and interpretation are ongoing. After sufficient validation, proposed endotypes can be used for redefining disease subtypes and fine-tuning of diagnosis and treatment. AsthmaMap is being developed in close collaboration with the LCSB MINERVA team. Mazein A, Knowles RG, Adcock I, Chung KF, Wheelock CE, Maitland-van der Zee AH, Sterk PJ, Auffray C; AsthmaMap Project Team. AsthmaMap: An expert-driven computational representation of disease mechanisms. Clin Exp Allergy. 2018 Aug;48(8):916-918. doi: 10.1111/cea.13211. PubMed PMID: 30133857.